John Coltrane is known as one of the greatest musicians of the 20th century. He played longer solos than Miles Davis on Kind of Blue, created A Love Supreme, and constantly pushed jazz in an increasingly experimental direction during his short and prolific life. His life ended unexpectedly in 1967, and he would not live to see the impact of his experiments. His last year of life was spent touring and cutting records in the studio. 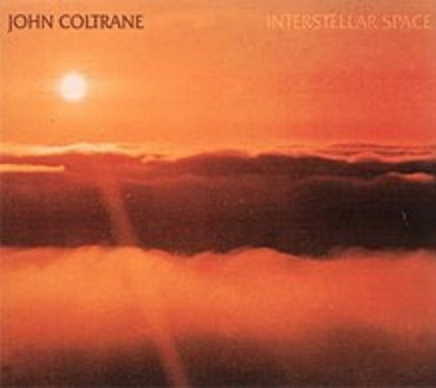 It was during this time that he created Interstellar Space, an album which would not be released until 1974. By the time the album was printed, the landscape of jazz had changed dramatically, and ironically, this record, which was so profoundly cutting-edge, seemed to fit well with some of the sounds of the day such as Corea’s Circle and McCoy Tyner’s Extensions. It stood almost completely alone at the time it was recorded, and the release date somewhat obscures this fact. By the end, Coltrane was so free that he had lost many allies. His original drummer left, calling John’s new sound ‘noise’, and his ingenious wife Alice played keys. A Newport performance in 1966 shocked jazz audiences, and this was only a small preview of what was to come. By 1967, the only musicians still playing with Coltrane had an undying vision for his genius. No musical terminology can express the sounds on Interstellar Space. They are simultaneously unorganized and completely logical; foreign to the ear yet totally energizing. This album was my first step off the diving board. I thought I had listened to free Jazz before I heard this album, but I was paralyzed by what I was hearing. I remember turning the lights off in my dorm room and turning the volume as loud as it would go on my speakers. The music was energy in its purest form. It is worth noting that Rasheid Ali’s shocking spasmodic drumming is both as free and as innovative as Coltrane’s solos. Without Ali’s vision, this album would not have been possible and it certainly would not reached the incredible level of terror that it does. He was virtually the only man up for the task of matching Coltrane’s imagination and energy. Each composition begins with a small pattern of bells and shakers, and then Coltrane ‘enters his spaceship’, as many have said, moving in any which direction he pleases. I listen to this album and think of Charlie Parker, whose free flowing improvisations captured a young John Coltrane and helped him create his own vision. To me this album is another stop on Parker’s train. These were two men with troubled lives and short careers who challenged the character of the genre they helped define. What is so profound about Coltrane is how much control he had over his instrument. When you listen to second takes of compositions that sound completely improvised, you hear him deviate slightly but maintain the nuances of his darting and chaotic solos. This was the work of a genius who had transcended the Cool Blue that he helped define, and even the free-flowing nature of his magnum opus, A Love Supreme. I listen to this album and wonder what would have been next for John Coltrane. How much freer could he possibly have gone? Would he have returned to a more structured sound? The only way for us to speculate is to look at the things created by those in his orbit. Pharoah Sanders, his prodige, turned to instruments from around the world and created albums like Karma and Thembi. Journey In Satchidananda, an album credited to Alice Coltrane but featuring Sanders, seems like a logical progression from the unforgiving sounds of Interstellar Space, if that is even possible. But any guessing is only speculation. John Coltrane dictated both where he went and where jazz went with each step further from convention. Interstellar Space offers a clue as to where the legend may have gone, but nothing more. It was a final Giant Step taken by a jazz titan.